Washington Rep. J.T. Wilcox is the new Republican state House minority leader. His first test is to guide GOP candidates through the November elections in what could be a challenging political year. 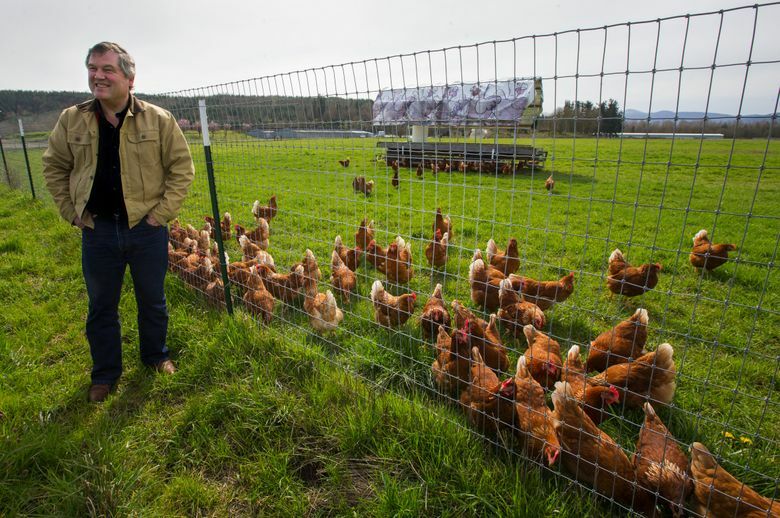 ROY, Pierce County — Between greeting a mob of murmuring chickens and sharing thoughts on ancient Greek history, state Rep. J.T. Wilcox compares the difficulties of legislating to running a family farm. For Wilcox, part-owner of a fourth-generation 1,500-acre farm, family business and legislative politics share some of the same challenges. “You’ve got all these people that have the same right to be there as you do, you can’t fire any of them, and you have to get along,” said Wilcox, 55, who was selected last month as House Republican minority leader. First elected to the House in 2010, Wilcox has helped shape the state GOP’s message in an era when Republicans and Democrats have fought fiercely over control of the closely divided Legislature. As minority leader he replaces Rep. Dan Kristiansen, R-Snohomish, who announced his retirement in March. Kristiansen had a reputation as a mediator between the parties when tensions ran high in Olympia. It remains to be seen how Wilcox will lead House Republicans. Republicans describe him as energetic and balanced. “I think he can make our caucus stronger,” said Rep. Gina McCabe, R-Goldendale. Democrats see an effective, if sharp-elbowed, political operator. “He’s a smart guy,” said Rep. Steve Tharinger, D-Dungeness, but sometimes oversimplifies issues into a rural vs. urban political divide. “He really does deal in symbols more than reality,” Tharinger said. Wilcox’s first challenge is to recruit candidates for this fall’s elections and help chart an electoral path in a year where many are forecasting a Democratic wave across the country. Democrats hold a two-seat majority in the House and control the Senate by just one-seat. If Republicans gain control of a chamber — or force a 49-49 tie in the House — they’d gain enormous leverage on taxes, spending and other government policy. But first things first: those murmuring chickens. They’re Rhode Island Reds, and part of the Wilcox family’s wide-ranging egg operation. You may have seen them on grocery shelves, or encountered the family’s commercials for products like fresh organic eggs, or hard-boiled eggs, sold two per package. James Truman Wilcox — he’s gone by J.T. since childhood — spent decades working in the family business, starting as kid, he says, cleaning up manure with a hand-scraper. As a teenager, he worked on the farm’s irrigation systems and tractors. He later oversaw dairy operations and became chief financial officer. He attended Washington State University. Since he knew the family business would be waiting for him, Wilcox majored in history. Earlier this month, he stood on a hill overlooking the farm — the spot where he and his wife, Kathy, were married — and unfolded a tangent about the warring Greek states and the fragility of societies. “When we talk about civil discord, when Thucydides wrote about the civil war in Athens, that tells you how awful it can get,” he said, with Mount Rainier looming in the distance. He ran for office nearly a decade ago, after the family sold its dairy operation, he said, but the Wilcox clan had long been tuned in to state politics. For the 2010 elections, Republican Rep. Tom Campbell announced he was going to make a bid for Congress rather than run for re-election, according to news reports at the time. Wilcox decided to run for the state House seat; then Campbell changed his mind. Both Republicans faced each other in the primary and the November general election. Wilcox won both. While he admired Campbell, Wilcox said the incumbent “felt like he was too left for the district,” which includes parts of Pierce and Thurston counties and the cities of Yelm and Eatonville. In late 2012, Republicans named Wilcox their floor leader, an important position that helps shape the party’s message during floor debates on bills. His key interests include helping business and spurring economic development, especially in rural areas. That complements a Republican state party that recently has pointed to Seattle more and more as an example of undesirable Democratic priorities. This year, lawmakers approved a bill by Wilcox to address suicide and mental health issues among agricultural workers. In Wilcox, Democrats see a tactician known for recruiting strong Republican House candidates, and a tough opponent when the Legislature is in session. “He’s up for a good fight, always,” said Rep. Marcus Riccelli, D-Spokane. As the minority party, House Republicans are sometimes known to “try and to throw a little dirt on our messaging and our values and the bills we’re trying to push,” Riccelli said. This year, Wilcox faces national political headwinds and an energized Democratic base while trying to replace several House Republicans who have announced their retirements. Under eight years of President Barack Obama, the GOP picked up a slew of state House seats. House Democrats in 2008 enjoyed a 63-35 majority, which has since dwindled steadily. Research shows the party out of the White House traditionally gains seats in Congress, governorships and state legislatures. Now, under President Donald Trump, the script is flipped. Wilcox said he tries to recruit candidates who have lived in their legislative districts at least a decade, and have ties to their area through business, government or community service. They’re recruiting candidates to challenge Democrats on the Olympic peninsula and southwestern Washington, which include three counties — Clallam, Grays Harbor and Pacific — that voted for Trump in 2016. Meanwhile, Republicans must protect a trio of seats left open by retirements around Issaquah and Puyallup, which Democrats see as pickup opportunities. Like other Republicans, Wilcox must also figure out how he wants to treat Trump. The president’s recent announcements of new tariffs on certain goods from China has drawn retaliatory responses by the Chinese government that could hit Washington state exports like cherries, apples and wine. When the Legislature returns in January, Wilcox will have to choose whether to embrace the path of his predecessor, Kristiansen, as a mediator, or head in another, perhaps more confrontational direction.